During the summer school in Markelo, Wilko Vriesman Sensei announced that Jasmin Biščevič will be his first uchi deshi - a live-in student who devotes himself to training, maintaining the dojo, and personally serving the dojo's sensei. Jasmin will start in September and stay in Amsterdam until the annual winter school, which Slovenian Aikikai traditionally participates in. He will not only practice intensively, but also represent Slovenian Aikikai at international events throughout Europe. 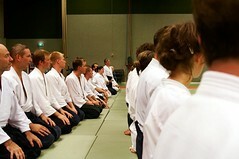 A 10-member delegation from Slovenian Aikikai took part in the 11th international Aikido summer school in Markelo, NL. 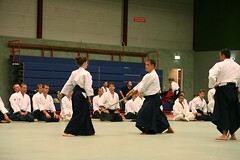 This was another great opportunity to practice using the modern Aikido methodology developed by Wilko Vriesman Sensei. Training on tatami for five hours a day over eight days with more than 40 black belts (1-4 dan) is more valuable than even four months of regular practice twice a week in Ljubljana. Participating in international Aikido seminars is a key factor in Slovenian Aikikai's rapid advancement. Thanks to Slovenian Aikikai's international contacts, an Aikido workshop was held here by Wim van Gils, a 4 Dan Aikikai from Belgium. Wim is one of Wilko Vriesman Sensei's best students, and represents the line of Christian Tissier Shihan in Belgium.